Perfect...as usual from Jacks..If you need something that fits a older machine this is the place to find it..Such as parts for,Garden tractors,lawn mowers and other small engine repairs... Dave in Pa. The kit came on time and all parts fit perfectly. motor runs like new again. thank you very much. This kit had everything that I needed to tune-up my riding mower for the grass cutting season. Getting everything in one kit is much more convenient and cheaper and you don't have to go to several locations to get he various parts. This is a great idea and I would recommend it for anyone with a riding mower. 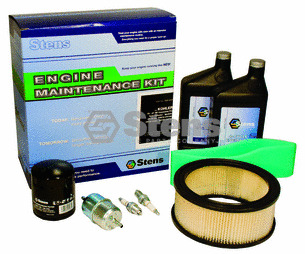 Ask us about the Stens 785608 Maintenance Kits. Please no repair questions. Your Q&A may be posted to Jackssmallengines.com to help other shoppers, like you, with their purchasing decisions. Thank you.